But by the 1980s, after decades of habitat encroachment, the Asian elephant had been declared an endangered species. Thirty years later, the situation is far more urgent as the population dwindles at a speed much faster than the animals reproduce. With an estimated 400 elephants living in the wild and 450 domesticated, Laos is facing the grim reality of losing the remaining population in a few more decades unless action is taken. As the country develops, the demand for urban expansion grows: dams, roads, logging, city development and agriculture are squeezing the natural habitat of the elephants, and increasing the likelihood of conflict with humans. Furthermore, since elephants have proven an excellent tool in the logging trade, they are contributing to the destruction of their own habitat and being overworked to the point of no longer being able to reproduce. It is a vicious cycle; one that I had the chance to bring light to this fall when I joined the Elephant Caravan. On the first morning, my heart raced as I saw the nine elephants coming back to the campsite from the forest where they had spent the night grazing and resting for the day’s walk. In mid-November, I met up with a motley crew of performers, conservationists, educators and filmmakers who had descended upon Sayaboury, Laos to walk with the caravan, a 400-mile march beginning in Paklay intended to draw attention to the plight of the elephants. Arriving some two days after leaving my home in Brooklyn, New York, I joined the group halfway through their journey to Luang Prabang. On the first morning, my heart raced as I saw the nine elephants coming back to the campsite from the forest where they had spent the night grazing and resting for the day’s walk. By the end of the trek there would be 20, after a long stretch of 12 elephants. Being confronted by these massive, stoic creatures for the first time— walking alongside them, observing their grace and the veneration of the other members of the caravan—was at once incredible and disheartening. How could we let these animals fade into extinction? Despite the vast differences amongst our group, we had all ended up in this remote part of Laos for the same reason: to enrich the trek and create a unique way for people to connect with the elephants. One of the first women I met on the walk was Mirabelle Gautier, who joined the caravan as an educator. When the group would pause for lunch in a village, or stop walking early in the afternoon, she would be in the nearest classroom teaching the local kids about the importance of elephant conservation and how they can help in the future. Even though she was thousands of miles from home, Gautier looked at ease in the open air classrooms of rural Laos— smiling from ear to ear as 45 school children sang and mimicked the elephants with their hands held wide at their cheeks like the elephant ears they’d seen when we’d arrived in town. One of the nine elephants walking with the caravan outside of Ban Na Hai. In true caravan style, the elephants stay close together throughout the walk. Leaving Sayaboury, Laos on November 15, 2015. Schoolchildren look on as the elephants take over their schoolyard for a midday break and lunch. While the elephants are eating, the kids got to look on and learn about what makes elephants so unique and important. Crossing a bridge on the way to Ban Nongnong. Elephants can drink as much as 50 gallons of water a day, so every opportunity to stop and drink was a welcome one, especially in the intense heat. The mahouts stop at a beautiful overlook for lunch. Between the view and the elephant parking it was a pretty spectacular sight. The elephants arrive in a small village for a lunch break on the way to Ban Nongnong. After a long day, the elephants arrive at the campsite in Ban Nongnong and are taken out into the forest to spend the night grazing and resting up for the next day. Mirabelle met Sebastien Duffillot, co-founder of the Elephant Conservation Center and ElefantAsia, three years ago while traveling through Southeast Asia and he asked her to come back to volunteer teach during this years caravan. Duffillot had been planning the caravan for years. The first iteration took place in 2002 over the course of four months, spanning a much larger territory. This one, 1.5 months in length, was an abbreviated but fortified call to action. 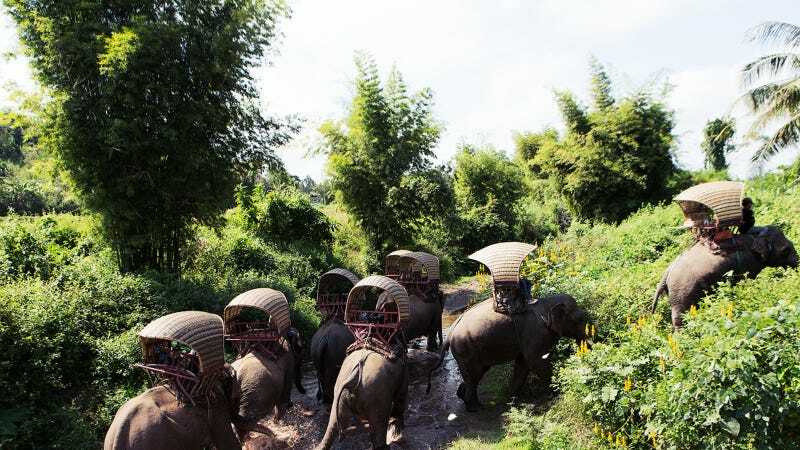 It hoped to engage the international community in a larger conversation about the elephants and their role in the ecosystem, and also aimed to bring up a new question in light of the 20th anniversary of Luang Prabang’s world heritage status—namely, what is heritage? Conserving the elephant is conserving the largest mammal that inhabits this territory. The environment in Laos, and across Southeast Asia, is suffering from an incredible rise in demand for hard woods and biodiversity products. This demand puts immense pressure on the tropical forest, and in turn, on every creature that inhabits the forest ecosystem. “Poaching is on the rise, deforestation is rampant, so it’s time to take action,” said Duffillot. “Conserving the elephant is conserving the largest mammal that inhabits this territory." Duffillot said that elephants are a “keystone species” in the environment, meaning they are vital to the ecosystem. “When you protect the largest you protect a lot of other smaller species,” he said. Duffillot also said the elephants are well respected in Buddhism and other Asian religions. “They have a very important status in the local culture and this is a lever to address issues such as deforestation, national park management and protection of biodiversity,” he said. The walk itself was not easy. Ten to fifteen miles a day in the scorching 100-plus degree heat, resting only for water breaks and a short meal of sticky rice and stewed pork or beef, the caravan plodded on. I was humbled by my own inability to keep up, my intolerance for the insane heat of the midday sun, and my exhaustion—which reached such frustrating heights at times that I just could not pick up my camera anymore. I was in awe of both the elephants and their human companions, the majority of who were walking and camping the entire length of the trip, as well as Duffillot for being so ambitious and steadfast in his plan. An elephant and his mahout walk to find a a good spot to rest in the forest after a long day of walking. Ban Nongnong, Laos. Anabel Lopez–Perez was the biologist at the Elephant Conservation Center and another one of the tireless members of the caravan who never left the elephants’ side. Having moved to Laos from Spain, she’s been working at the ECC for two years. Her main role with the caravan was to maintain the security and welfare of the elephants during the long trek. By day I would see her fierce gaze paying close attention to the elephants every move. If one was in a bad mood, she would make sure everyone walking was aware and gave the animal as much distance as possible. By night, she could be found sitting with the mahouts (the men riding on the elephants) in a circle discussing the issues that would come up each day on the caravan and what they could do to improve their work. Sompong Sintham, 25 years old, was the mahout for elephant Mae Kham, age 42. He learned how to be a mahout from his father-in-law, who also traveled with the caravan. On my last morning, I peered out of my tent into the mist—a beautiful and daily occurrence this time of year in Laos. In the distance I could hear an elephant trumpeting what sounded like a perfectly reasonable alarm clock. Headlamp on, I dissembled my campsite in darkness and followed the sound of the generator—coffee. Must… have… coffee. I had only been with them a few short days and could already feel the exhaustion taking hold. Somehow this caravan of 40-plus people would continue to grow and maintain this routine everyday for one-and-a-half months: Wake at dawn, pack tent, drink coffee, eat sticky rice, walk with elephants, educate, perform, sleep, repeat. In rain and extreme heat, frequently physically drained and facing whatever challenges might present themselves when you’re living as a nomad, I never heard a single complaint. My admiration grew. The mahouts piled into another truck to retrieve the elephants from the nearby forest just as I was saying goodbye, and I watched them fade away in the rearview mirror with mixed feelings, unsure of how to fix the myriad of problems working against these beautiful animals. Sack, Duffillot’s assistant, dropped me off in front of a small market and instructed me to wait on the side of the road for a white pickup truck that would be full of rice. They would take me back from where I had just walked, Sayaboury, to catch a bus to Luang Prabang, eventually catching a flight later in the day to the bigger hub city of Vientiane. I thought about my first day walking with the elephants. The leader of the group, a male, kept raising his trunk and I decided to step in front of him to get that classic elephant shot. I was quickly walking backwards to keep my distance from him, but Lopez–Perez saw me shooting and immediately pulled me aside. It’s human nature to love things we can relate to, and the anthropomorphic nature of elephants is easy to latch onto. “Don’t do that,” she said simply. I had only gotten two shots, and tried to brush it off with a small joke, but she was serious. The elephant was being monitored for Musth, a time when male elephants testosterone levels skyrocket and they become unpredictable, sometimes violent. It’s human nature to love things we can relate to, and the anthropomorphic nature of elephants is easy to latch onto: It makes you want to be close to them, and to treat them in the affectionate way we treat our household pets. But these are not cats or dogs—they are giants—and when we make even the slightest misstep, it could be life threatening. It was during these moments photographing the elephants that I realized how little I really know, and what a critical role education will play in saving the Asian elephant from extinction. The journey to Ban Nongnong, where I left the caravan, had taken a few days of walking—but the trip back in a car was only 45 minutes. I looked on as the landscape I was now extremely familiar with blurred past. It reminded me of how quick we are to move on, steamrolling where we came from to make room for the future, and how sometimes we would be better off lingering for a minute to consider our actions. Morning, afternoon and night, educators and conservation specialists have been working with school kids in rural classrooms, and performers put on nightly shows detailing the troubled future elephants are facing. Follow their journey here and support the Caravan and the Elephant Conservation Center here. Tara is a travel photographer based in Brooklyn, NY. She has contributed to Makeshift Magazine, Monster Children, Roads and Kingdoms and more, following her work to places like Morocco, Mali, South Sudan, Laos, and beyond.